The company in “Sunday in the Park with George” at the BU Theatre through October 16, 2016. Photo: Paul Marotta. As with many of Sondheim’s masterworks, the money men obviously took it on faith that the master composer and lyricist would be able to craft – in this case, along with the considerable talents of book writer and original director James Lapine – a sustainable work with the power to grip audiences. The answer, of course, was yes, with the latest example the Huntington Theatre Company’s sublime production of the Pulitzer Prize-winning musical. For “Sunday,” Sondheim and Lapine crafted two acts that are actually disparate plays a century apart. Act I takes place over a series of Sundays in a two-year period from 1884-86. We meet the characters who are being sketched and will become part of Seurat’s vision as he painstakingly – and with a new technique usually described as pointillism – recreates a lazy summer afternoon on La Grand Jatte on the banks of the Seine. Members of the cast will re-emerge as different characters in Act II at an American museum a century later where George, Seurat’s great-grandson, is confronting an artistic crisis that has him seeking advice from grandmother Marie. 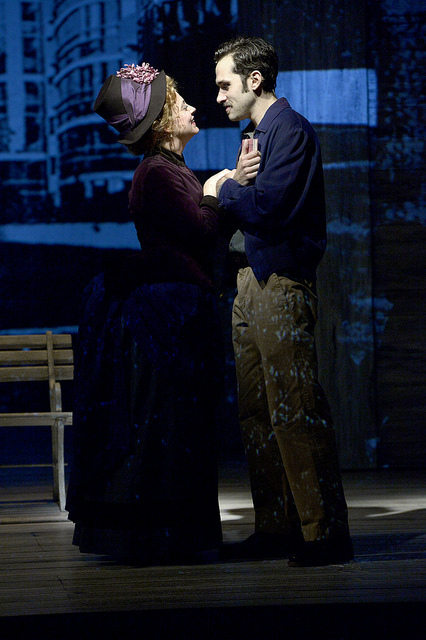 Jenni Barber and Adam Chanler-Berat in “Sunday in the Park with George” at the BU Theatre through October 16, 2016. Photo: Paul Marotta. In casting this show, the Huntington has again – as it did in “A Little Night Music” – relied heavily on the large pool of local talent after casting Broadway veterans Adam Chanler-Berat as George and Jenni Barber as Dot, his mistress, in the leads. Josh Breckenridge is Jules, an artist friend – or perhaps jealous rival? – of George who is called upon to render his opinion of Seurat’s work, and whose motives are suspicious in his rejection of the piece. Aimee Doherty is Jules’ wife Yvonne, somewhat smitten – as are all the women – with George. Sulfaro is fine as the baker who takes up with Dot after she leaves George, and supporting cast fares just as well, including BU grad Patrick Varner as Franz, Jules and Yvonne’s coachman, Morgan Kirner and Sarah Oakes Muirhead as two shop girls, and Andrew O’Shanick as a soldier. There’s also a fine supporting turn from Todd A. Horman as a crass, vulgar, swaggering boatsman. 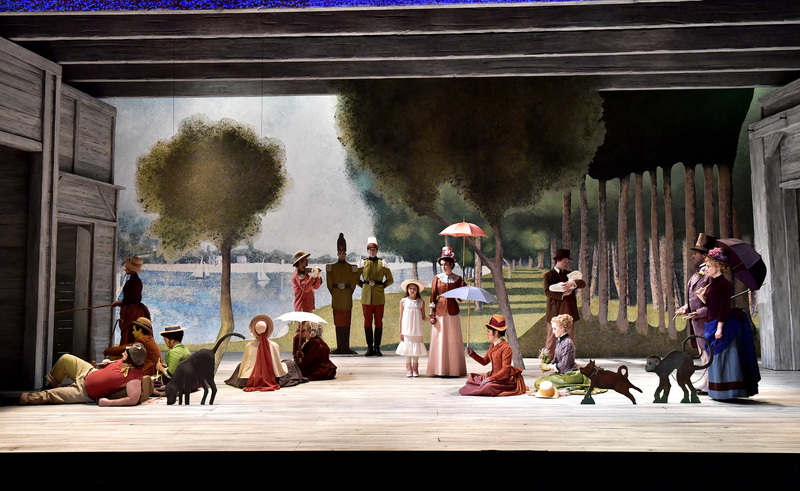 Members of the cast who appear in Act I – usually being sketched by Seurat – will return in Act II as George, Seurat’s great-grandson confronts an artistic crisis and seeks advice from grandmother Marie (Barber in a dual role). This production also happens to be a feast for the senses thanks to the Huntington’s usual superb production values, authored by a variety of designers who work in sync to achieve the order and balance the artist sought. That would include the stunning, all-important lighting designed by Christopher Akerlind. Derek McLane’s artist’s studio becomes much more, and his stunning Act II choromlune is another visual highlight. Add Jon Weston’s exquisite sound design and Robert Morgan’s lovely costumes and there are endless treats for the eyes and ears. Choreographer Daniel Pelzig, who has crafted a strong working relationship with DuBois, is charged in the climactic Act I scene with arranging the players just so as they are in the painting. DuBois also has forged the same type of relationship with music director Eric Stern, whose orchestra performs a lovely replication of the score that is in perfect sync with the voices, again much like the order, balance and tone Seurat was seeking in Un dimanche après-midi à l’Île de la Grande Jatte. The Huntington’s sweeping commitment to one composer – even one as gifted as Sondheim –is not without its risks, but DuBois in in an interview makes his case. For those of us who share that view – that means you, Spiro Veloudos, of Lyric Stage who started the “Back to Sondheim” movement and whose troupe is currently authoring a splendid production of “Company” – it means there are more good times ahead for like-minded Boston theater-goers. And because both “Sunday” and “Company” are running concurrently, Sondheimophiles have a chance to do a baseball-like day-night doubleheader if they choose. We await with bated breath a decision to see where DuBois and Co. will go next. The Huntington Theatre Company production of “Sunday in the Park with George.” Music and lyrics by Stephen Sondheim. Book by James Lapine. Directed by Peter DuBois. Chorerography by Daniel Pelzig. Music direction by Eric Stern. Set design by Derek McLane. Sound design by Jon Weston. Lighting design by Christopher Ackerlind. Costume design by Robert Morgan. Avenue of the Arts / Boston University Theatre through Oct. 16. huntingtontheatre.org.